The Boulton Paul Overstrand is 2.5 MB. Larger files take longer to load. This is the Boulton Paul Overstrand listing page, here you can download the plan, article and see the main thumbnail and extra images. 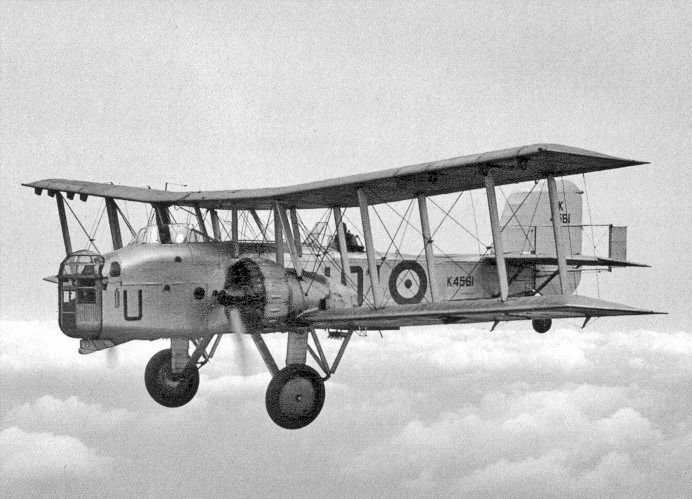 The Royal Air Force's last biplane 'heavy' bomber, the Overstrand is so ugly it is beautiful. The last few remained in service until 1942, mostly used for gunnery training. Although slow (150 mph was considered the max) they could be looped, rolled and spun and often were at airshows. It is said their pilots loved them. The Overstrand was fitted with the first RAF example of a powered gun-turret, since handling and aiming twin .303 machine guns in a 150mph breeze was found to be impossible, and also had upper and lower open gun positions towards the tail. The tail is interesting too, the fin was fitted with a 'servo' tab to assist the pilot, presumably it worked in a direction opposing the main rudder to provide some 'push' off center. But I can't be sure about that. These plans are intended for the makers of solid models, but are clear enough for those with the space and the skill to build a flying scale version, which would surely be a 'sight to behold'. These are the details for the "Boulton Paul Overstrand" plan. If you would like to become a plan editor and help us to edit the attributes of all the plans in the website please click the "Edit Attributes" button below. Order your Boulton Paul Overstrand prints today! The Boulton Paul Overstrand plan can be printed on plain paper, tracing paper or polyester film and shipped worldwide. This tool allows you to calculate the cost of printing and shipping the Boulton Paul Overstrand plans and its building article if available. If you need to resize a plan please contact us with the ID:101784 and the desired wingspan. I will calculate a price upon request, please contact me here mentioning this PlanID: 101784 and the job you wish me to do. This plan is 2.5 MB and was shared by our member Alan Smith on 16/12/2018 10:01 in the Vintage Articles with Plans category. It has been downloaded 70 times. Alan Smith has spent time working on this plan so you can have it now, you can always leave him an appreciation message. Alan Smith will surely like to see what you have build from his plans... You can share your builds at our Forum under the Build Logs section.